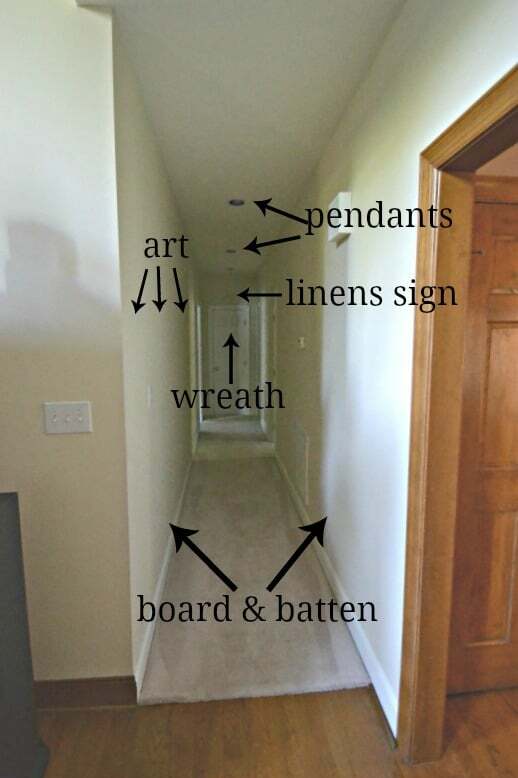 How to turn a long, dark hallway into a bright, not so cave-like space with just a few improvements. Well…I’ll be honest. I’m kind of shaking my head and wondering if you’ll think I’m wasting my time sharing my hallway makeover with you. I feel like I need to apologize for the photos – the hallway is an absolute nightmare of a space to photograph! But – the hallway was on my list of goals for 2018 and I already shared my plans for it, so share the reveal I will. Plus, several of you mentioned that you have a dark hallway that you don’t know what to do with, so maybe this little makeover will give you some ideas for your home. This makeover was really fast and simple, so let’s take a trip down memory lane. This is what our hallway looked like when we purchased our home. Dingy paint, pale pink carpeting and even pink bulbs in the can lights. As a reminder, here is the mood board that I created for my plans. By the way, you can learn how to make your own mood board right HERE. And here’s where we were mid-makeover. No more carpeting, freshly painted walls and trim and the beginning of a board a batten wall on each side of the hallway. All those doors, air returns and other necessary stuff on the walls made it a bit tricky to get the board and batten lined up just right, but I’m extremely happy with the way that it turned out. And here’s the finished product. Do I love it? You betcha! With a few simple changes, our almost 20′ long hallway no longer looks like a dark pathway of doom. The wall on the right might look a little bare to you in the photo, but it would have made the hallway entirely too closed in to hang something on both that wall and the one on the left. All resources are listed at the bottom of the post. I spent quite a bit of time selecting lights, but the hallway has 9′ high ceilings so I opted for pendant lights instead of flush mounts. I think they help to fill up some of the emptiness. Because the openings for the can lights were so large, we covered the holes with matching ceiling medallions when the pendants were hung. Finding a runner for the hallway was a bit of a challenge because not only did it need to be long, I wanted it to have a horizontal striped pattern to it that would help the hall to appear wider. The one that I wound up choosing is perfect – it’s dark enough that it won’t show dirt, but not so dark that it darkens the hallway, it has the horizontal pattern I was after, it ties in well with the gray rug in our family room, it’s long enough and it was very affordable. The other thing that I struggled with a bit was what to use for artwork to fill the large frames that I already had up in my attic. I was planning on botanical prints of some kind, but I decided that I wanted something really, really simple since this is such a closed in space. So I created three super simple printables that have a modern farmhouse feel to them. 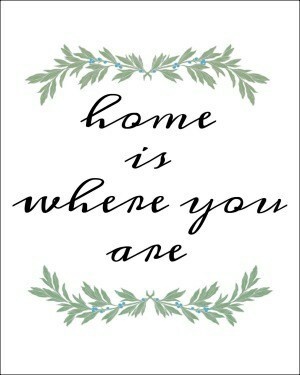 Each one of the printables centers around home and here’s each one looks like. 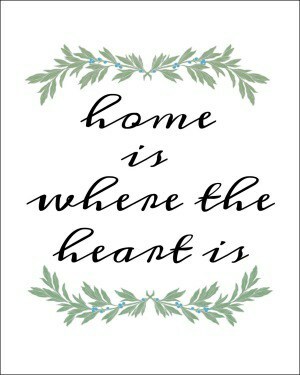 They are sized for an 8 x 10 picture frame and can be printed on normal 8½ x 11 printer paper. None of the black lines are on the actual printables. If you don’t already have one, sign up for a box.com account (it’s free with no obligation) so that you can download the printables. These are for your own private use and are not to be reproduced or sold. The black lines around the image will not appear on the printable. The only thing that I didn’t do from my original to-do list was to add a sign above the linen closet because I decided it would just be too much busyness for the confined space. Affiliate links have been used which allow me to make a small commission from your purchase, but at NO additional cost to you. See my full disclosure HERE. 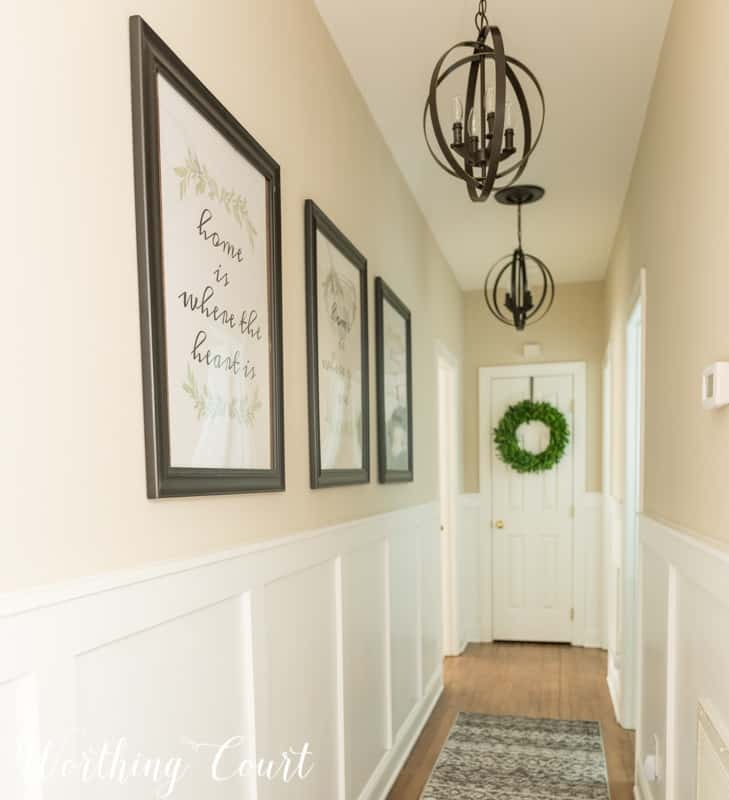 Love, love, love the hall way. I have a very narrow hallway, not as long as yours, but , never the less, a challenge to decorate…Well done!!!!! We hung some artwork on one side of our long hallway and three diamond shaped mirrors on the opposite wall. Really changed the feeling of the space. Next step is a new ceiling light. Still looking. Thanks for your inspiration. OMG!!! I love your hallway! I am going to try this! Thank you so much also for the printables! Yes, the hallway looks great! I wish I had a long dark hallway! Love all your decorating ideas! It looks so much better!! Light and bright. I love the pendants and the ceiling medallions. The board and batten make it look really fresh. Thanks for the inspiration. Hopefully, I can use some of these tips for my hallway. By the way, what paint color did you use? I know that a lighter color is needed for my hallway. Thanks for sharing! Hi Babette. So glad you like my makeover! The wall color is Sherwin Williams Accessible Beige and all of the white that you see is Sherwin Williams Extra White. Amazing what you did with your hallway Suzy. Looks absolutely terrific! Very bright and inviting. Love your hallway!What a great job! It looks fabulous. I am loving the rug! When I looked at it on Overstock is appears quite dark but in your pics it isn’t as dark .. I’m just wondering if you think its lighter than it shows on Overstock. I am looking for something in between light and dark and was thinking your rug could be it! ANYWAYS, what a difference from the before pic! Enjoy! Thanks for the helpful guidance!! You did a great job brightening up your hallway. I love the pendant lights, and the board and batten look great. Such simple ways to add a lot of style and a facelift to the original hall. 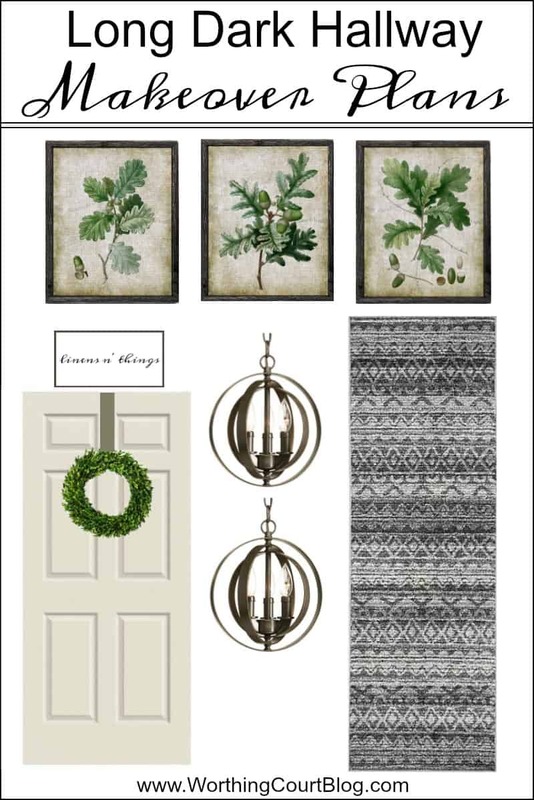 The boxwood wreath looks great and draws your eye to that end of the hallway. Good job! Wow..looks amazing. I love the interest the board and batten provides. Great job. I love the makeover! Looks wider and MUCH more inviting!! Outstanding!! What a bright transformation. The pendant lights were a great idea as they add the perfect interest and pull your eye up instead of down. I’m partial to board and batten, so I feel it adds the exact amount of brightness needed. Boxwood, another favorite, defines the end of the hall eliminating any tunnel feeling. Love it! Thank you for some great ideas. Lovely! You did a great job!!! You’re so talented!!! I love your hallway!!! I have almost the exact hallway upstairs in my house and this gives me lots of inspiration! 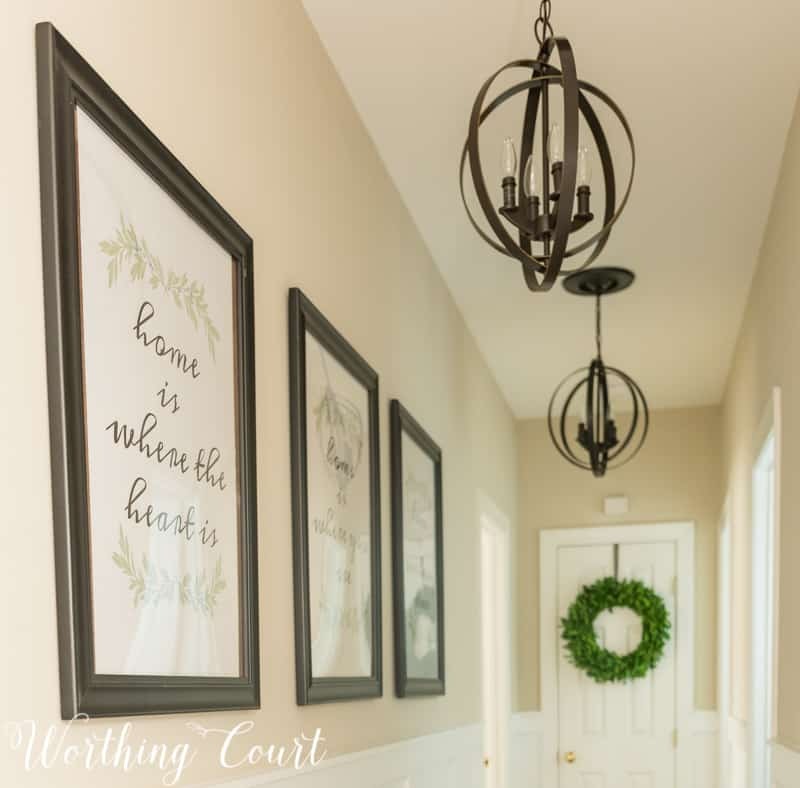 I love how you changed out the recessed lights with the pendant lights – what a great idea! Looks awesome!! People tend to forget about dcoraring hallways. It’s also a great place for collections of paintings that due to colors may not fit in with decor in other rooms. Wow! What a difference.. It was dark and forbidding and you turned it into a welcoming area. It makes you look all around instead of just straight ahead. Beautiful! What a gorgeous transformation! I need to work on my hallway going from the kitchen to the garage. After we painted, I left it blank until I decided what to do and now it’s looking pretty sad! Love your lighting! Your makeover came just in time for me! I have an almost identical long, dark hallway with a bathroom at the end. I love the simple green wreath on the door! I have shopped, forever it seems, to find just the right artwork to add to our walls and your printables are just what I had in mind! I really like how the prints tie in with the green wreath! Thank you, thank you! Also I was thinking of adding a mirror on the other side of the hall opposite the artwork. I thought it might widen the appearance of the hallway. I like Kathy’s idea of three diamond shaped mirrors on the opposite side. Do you feel like mirrors will interfere with the artwork? Hi Nancy. I think art on one wall and mirrors on the other would be fine as long as you don’t make the layout of each side of the hall the same. In other words, if I had wanted to hang three mirrors on one wall, I would have made the art on the other wall look more like a gallery wall in stead of three pictures lined up like I have now. Hope that makes sense! It looks great! Just wondering if you actually placed board to the walls before the battan or just put battan on top of your walls? If so, do you notice any texture from the walls? Hi Jane. We placed the boards directly on the wall and then caulked and painted everything the same color. There isn’t an issue with texture since our walls are just regular sheetrock. But – if my wall had texture, I’d add a thin board to the wall to cover the texture up before adding the batten boards. Board and batten is genius! The Hubs had to admit that it truly does not narrow the space. 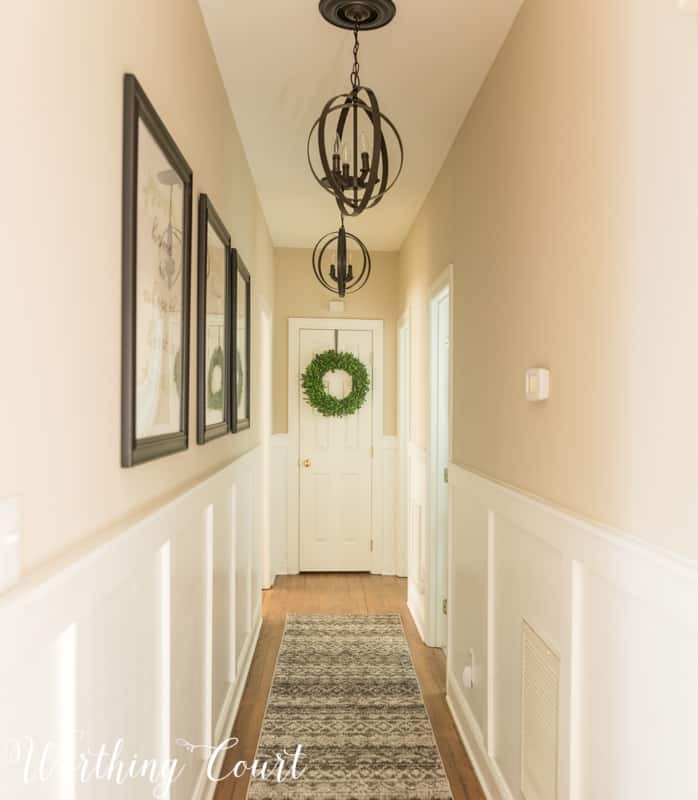 Our only problem is that we do not have a long narrow hallway, but I’m thinking this just might accent our little hallway and the alcove that connects our greatroom and master suite. Thank you! What page are you trying to get to, Shelly? Thank you for sharing your beautiful decorating ideas! So often we overlook spaces that may be smaller and awkward because they are more challenging., however , the visual impact with the updates you’ve made are amazing. I absolutely love what you did to your hallway! It is so inviting! What a great hallway renovation! It’s beautiful and has inspired me to redo our long hallway. It’s just about the same length. May I ask, what is the width of your hallway? Many thanks for such great ideas! Hi Rebecca. So glad you like the makeover! Our hallway is 42″ wide. I love your hallway makeover! The changes you made are wonderful! OMG I can’t believe the transformation!!! It’s gorgeous – go you! I LOVE the pendant lights, and I love everything else you’ve done here too. It’s absolutely unique – the prettiest hallway I’ve ever seen! I wouldn’t have believed it possible to make a hallway feel so different! Love your ideas. Shared your blog with some friends and they love your style. We decided we could truly be friends. Thanks for all the information, I will use them in my home. I love the artwork! I am inspired to redo the overlooked hall in my 1970’s ranch. Did you print the downloads larger than 8 1/2 by 11? I would like to frame them in a poster frame. I just downloaded the printables and I’m so excited to get started. Choir hallway is so appealing! Can I ask the size frames you have the printouts in? They look bigger than 8×10 but there isn’t any matting. Thanks for sharing your make-over with us. I believe that the frames I used them in are 22 x 24, but I only created free downloadable images for an 8 x 10 frame. I had no idea that anyone would want the larger size. You could trying to print the 8 x 10’s larger, but they might be blurry. If you do want the larger version, let me know and I’ll see if I can locate my larger images. Did anyone ever respond about enlarging the printable images? 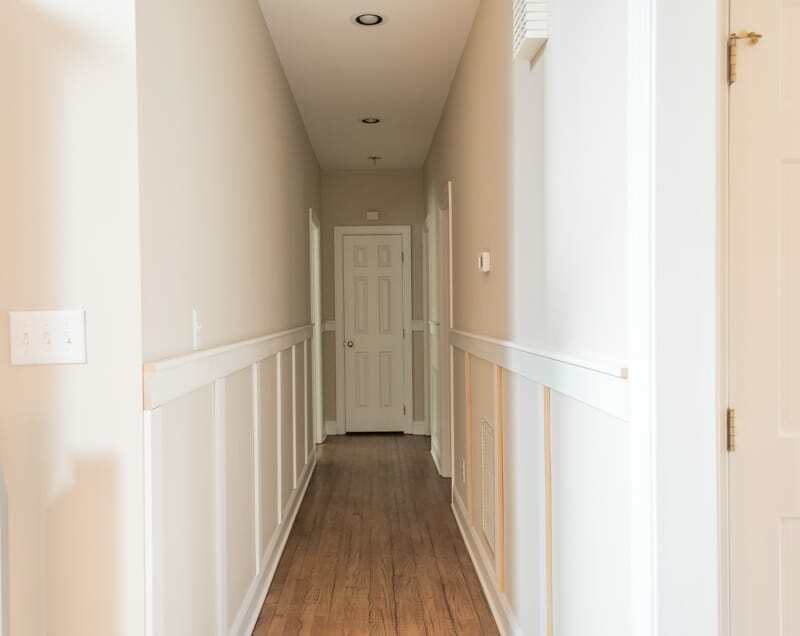 I know I am late on this post but I have a long dark hallway too and I would like to do the board and batten look. What type of boards did you use and what did you use for your top rail? Did you just do the vertical boards to make it look like board and batten? Your hallway is beautiful and looks so bright. Can you provide larger downloads for the prints? I absolutely love them and your new hallway is fabulous! Hi Kathy. So glad you like my hallway! I can’t increase the size of the printables, but you might want to try what I did. I downloaded them to a thumb drive and took them to my local office supply store for printing, but had them printed in a larger size. The edges of the letters won’t be as crisp as with the smaller size, but they’re perfectly fine for framing and hanging on the wall.